1. Y'all, Kiss You Slow by Andy Grammer got me through a long-distance relationship single-handedly. I honestly think that it's the most romantic song ever (and also I'm lowkey obsessed with Andy Grammer so there's that). If you only listen to one song on this list, let it be this one. 2. I was introduced to Better Place by Rachel Platten through my love for Andy Grammer. She joined him on his 2015 Magazines or Novels tour, and honestly all of her music is wonderful, but Better Place is especially romantic. 3. 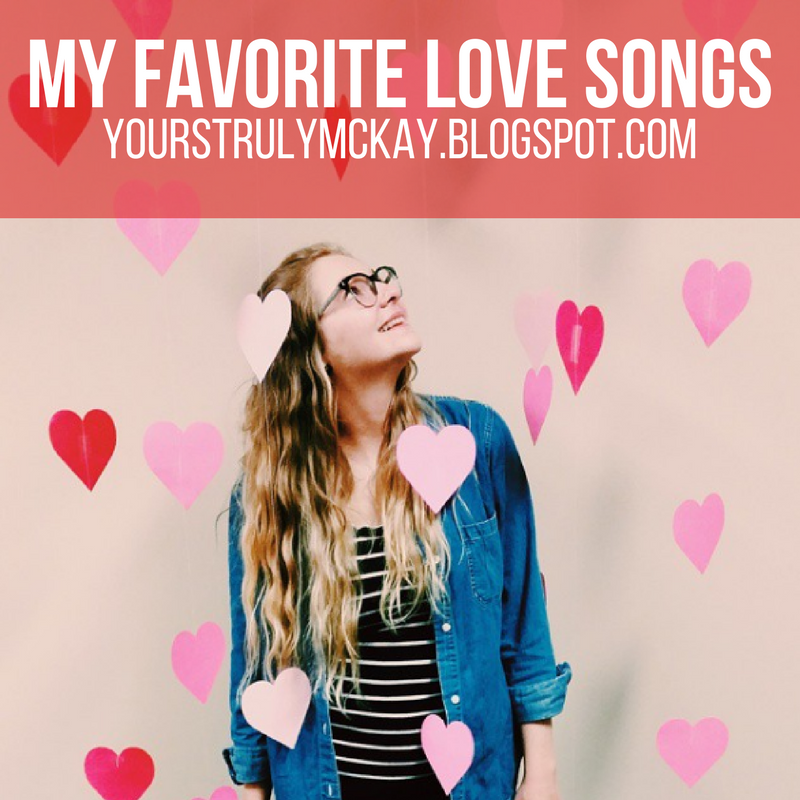 Taking a little it old school with this next one — if you ask me my all-time favorite song, my answer will always immediately be All My Loving by The Beatles. 4. I think All of My Days by Tyler Brown Williams is just one of those random songs that I stumbled upon on Spotify or Pandora, but I love it. I love love. It makes me want to hug a boy (or a cat) and never let go. 5. A friend introduced me to The Quiz by Hello Saferide solely because of the lyric "Can you wear socks at all time because I'm still scared of feet?" (Because, in case you don't know me like at all, I'm scared of feet). But the whole thing is super cute. 6. I love love love Love Love Love by Avalanche City. It's my kind of hipster, folksy sound, but also it's really cute and it makes me feel like guys really, truly fall in love. 7. You'll Always Be My Best Friend by Relient K has a special place in my heart because I used it in part of a birthday video I made for my friend Sloan, but also because it touches on my favorite part of being in a relationship — being best friends. 8. A few months ago I went to the real East High and I just about died, so you know I have to include Can I Have This Dance from High School Musical on the list. Forever dying at this and forever waiting for my Troy Bolton, honestly. 9. There's just something about a country love song, so how could I not add I Got A Car by George Strait? I just love hearing how their relationship grows through the years and I die every time. 10. I See the Light from Tangled will forever and always be the best Disney love song and will forever and always make me cry. Enjoy. Follow this playlist on Spotify as well. I think we can collectively agree that Valentine's Day gets more hate than any other holiday. Like, it gets an irrational amount of hate. People who are single groan about "Single's Awareness Day," and those in relationships rally around the fact that it exists solely for florists and chocolate companies. We'll y'all are haters. It's not like Santa Claus was alive when Jesus was born so where's the hate on Christmas??? Actually, you don't need to hate on Christmas either...but you get my point. 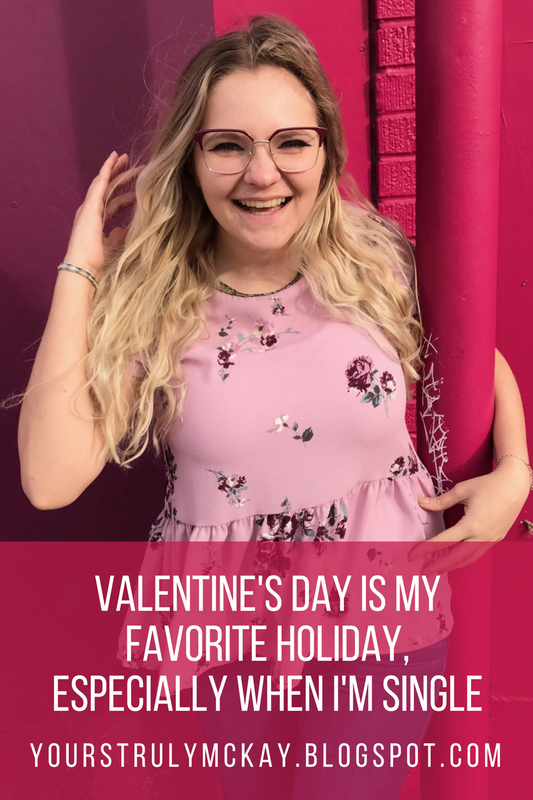 I personally love Valentine's Day and have realized in the past two or three years that it's actually my favorite holiday. Last year I had a Valentine, and this year I don't (unless you count my cat). Regardless, I'm still a happy little angel bumble bee pollinating love throughout my life. Yes, a good, healthy relationship will make you feel loved and appreciated any day, whether it's February 14th or not. But it's fun to have another reason to show appreciation to those that you love! And it's fun to be loved! Wait for it...I even like Valentine's Day when I'm single. Honestly, I especially like it when I'm single. A couple of years ago I spent Valentine's Day in Arizona with my friend Amber and my brother. This year I get to be in Florida with my eternal best friend (not of the husband variety, just of the I-know-too-many-of-her-secrets-and-flaws-for-her-to-get-rid-of-me variety). I am oh so happy! Life is oh so good! 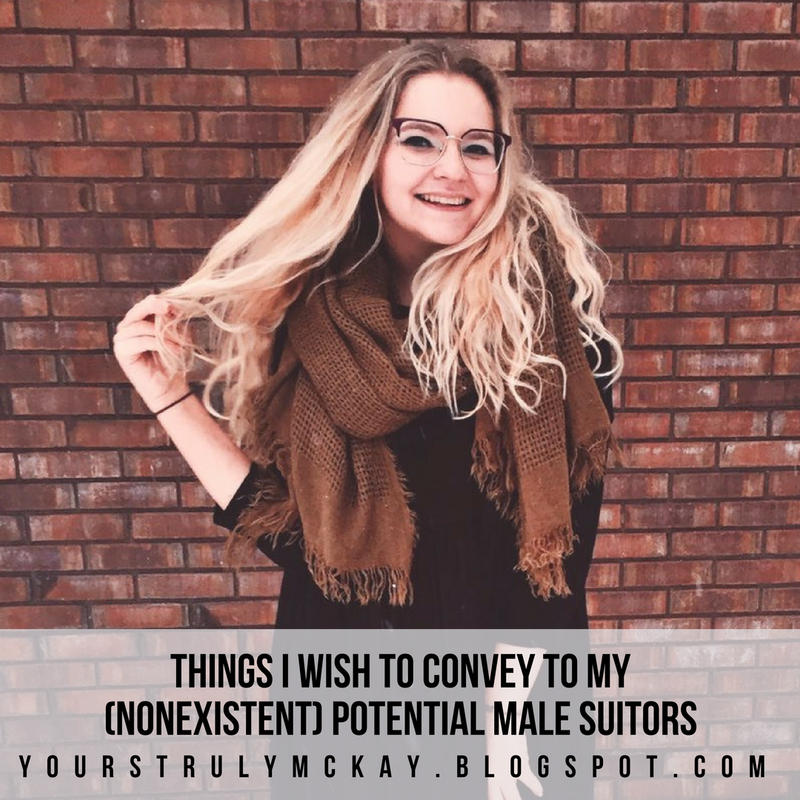 Yes, I am painfully aware that I'm single, but being single is fun if you let it be. You get to kiss how many people you want (not that I'm kissing lots of people, but also not that it's your business). You get to have cute boys buy you food. You get to sit in PJs and watch Music and Lyrics instead of dressing up just for an Instagram picture with a guy you've only been dating a month after going to a way-too-expensive dinner. I bet you can find a reason to love Valentine's Day. It's okay to be sad about being single, but Valentine's Day doesn't have to be about being in a relationship — it's about being in love. It's about being in love with life, with people, and with yourself. So let's celebrate love instead of hating it (because that's pretty annoyingly ironic, if you really think about it). We need to talk. Candidly. Our current elected president is fighting to ban Muslims (in a way that benefits him financially, of course) who would travel to the US from Libya, Syria, Iraq, Iran, Somalia, Sudan, and Yemen. The American people roared in protest of this injustice- for the first time in my consciousness, Muslim people were given value and precedence. #NoBanNoWall is still trending. It felt good. I stood in the DFW Airport on the first night the ban went into effect, and I too roared. I felt connected to every person in that terminal, each of us trying to protest for the rights of the detainees. That night felt like an anomaly, but it was a catalyst for other anomalous occurrences- celebrities tweeted in support of Muslims, GOP officials voiced their disdain for 45’s stance, and it seemed that maybe America was ready to embrace its Muslim population. And maybe it is- part of the American majority is kind, and tolerant, and most importantly, vocal in their support for us. But things are never as simple as they seem. This is not the first time Muslims have needed protection from bigotry, elected or civilian in its origin. I’ve lived through the other side of this trend, and I’ve witnessed its ravaging effects firsthand. I was 6 years old when the towers fell. I was 6 when America turned its back to my people. My dad was detained in Canada at the time, and lost his job shortly thereafter. Teachers who used to adore me chilled me with their sudden abandonment. My warrior mom donned hijab for the first time after the attacks, an act of faith and defiance. Other than a few exceptions, no non-Muslim classmate ever attended my birthday parties for the next few years. Every terrorist attack, every shooting, every bombing- to this day, Muslims fearfully watch the news and check their phones to determine the ethnic background of the perpetrator. Traveling through the airport is an insult to every Muslim’s dignity. Mosques always have security and surveillance set up in case of hate, fire, vandalism, and armed gunmen. My hijab is a source of endless hateful stares and even outright discrimination. Representative Jeff Leach of Collin County’s “Anti-Foreign Law Bill” directly targets Muslim populations, and he lied to my face when I asked him if he cared about his Muslim constituents. Children endure years of bullying, of taunts, of “Go home terrorist!” without reprieve. And let’s not even talk about Afghanistan, Iraq, Syria, Pakistan, Somalia, Libya, Iran, Sudan, Yemen, PALESTINE. We, the Muslim American population, have been under attack for 16 years. And now, they are trying to ban us. I have been fighting since I was 6 years old. I don’t want to be your Muslim friend. I don’t want to be part of your hashtag No Ban, No Wall tearjerker Instagram post. Somehow, right now, I don’t want your acceptance, or your solidarity. Not like this. Because I needed you in 2001. I needed your vocal acceptance and I wanted your open arms to take me in. America, you had a chance to do a good thing 16 years ago. Your silence was as hurtful then as 45’s loud-mouthed Islamophobia is today. And it’s such a cute sentiment, but y’all? 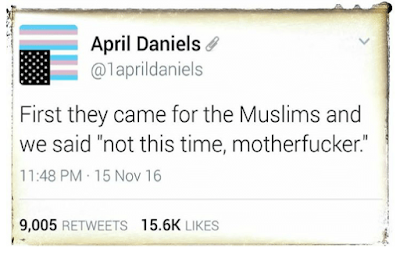 They already came for Muslims. Ever heard of the Patriot Act of 2001? Did you ever hear the alternate facts that led to the Iraq War in 2003, or the rationale used by American leaders to justify the use drone strikes on Muslim-majority countries? Have you ever listened to Glenn Beck, or Ann Coulter, or Bill Maher denounce Muslims on mainstream media outlets? Did you watch Ironman (2008), or Zero Dark Thirty (2012), or American Sniper (2014)? Do you binge watch Homeland? Or the new reboot of 24: Legacy? Do you know the name Deah? Razan? Or Yusor? They came over a decade ago, they saw a vulnerable minority community, and they conquered by concocting a media and policy narrative driven by fearmongering and bigotry. I want to go on, and I don’t at the same time. But I do not trust it. 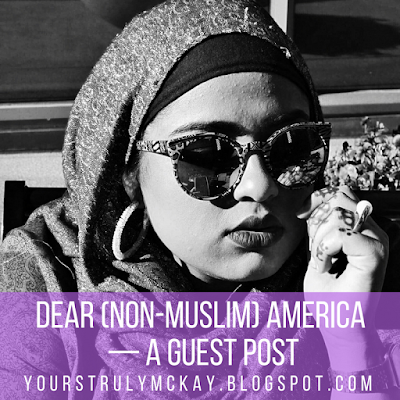 I step forward, gingerly, because I doubt your solidarity’s integrity, its ability to carry the weight I bear on my two shoulders as a Muslim American. I go to protests, and people tell me they love me, and I am welcome here. Do you think, after 16 years of silence, that I will automatically believe you when you proclaim your feelings? America, you have wronged so many minority communities. We are not the first community you have harmed and we are not going to be the last, but today, I am selfishly speaking of my own experience. Rejection is a common experience for non-white, non-Christian Americans. We know the discrimination that lies in wait within the American dream, and yet we persevere. Muslim immigrants, refugees, citizens- we are here. We belong. And because our faith of peace tells us so, we open our arms to a people who did not want us or defend us. America, you failed us in 2001, and all those years that followed. America, we’ve got your back in 2017, and all the years to come. 16 years of outrage and indignity have borne a wave of Muslim American activists, lawyers, doctors, teachers, politicians, actors, rappers, athletes, engineers, social workers, nurses, laborers, restaurateurs, entrepreneurs, business CEOs, and artists- the list goes on. All these people who love their country, and want it to prosper. We Muslims are forbidden from remaining silent in times of injustice and oppression, and we have learned to use our voices and our strength after years of powerlessness. We embrace you, America, flaws and all. We will shield you as you have shielded us, begrudgingly as it may have been. We will speak out for you, despite our rocky history. We will not go gentle into that good night. Together, with positive action and consistent activism, we will rage against the dying of the light. I love my body. I haven't always been able to say that and I can't always say it now with confidence, but I do love it. I love my hair even though it gets tangled just sitting there — it's my favorite of my physical traits. I love my muffin top, even though it forces me to dress accordingly — it gives me more room to eat French fries. I love the stretch marks on my thighs that I must've gotten when I was like 12 — they're my tiger stripes and make me feel strong and powerful. I love my eyes, even if one is squintier than the other — they help me spot puppers across the street that I can run to and pet. I have a horrible singing voice — but because I know I'm no good, I have a lot of fun doing karaoke. I like my legs — even though they're disproportionately long to the rest of my body, they make me look like I'm in shape (which I'm not). I like my acne — it keeps me humble. My skin's not perfect and I'm not perfect. But I'm still pretty darn great. I don't feel grateful every day, but my body has gotten me through it all. It helps me cry when I need to feel better, it helps me carry cat litter up three flights of stairs more often than I'd like, and it helps me hug the people (and cats) that I love. 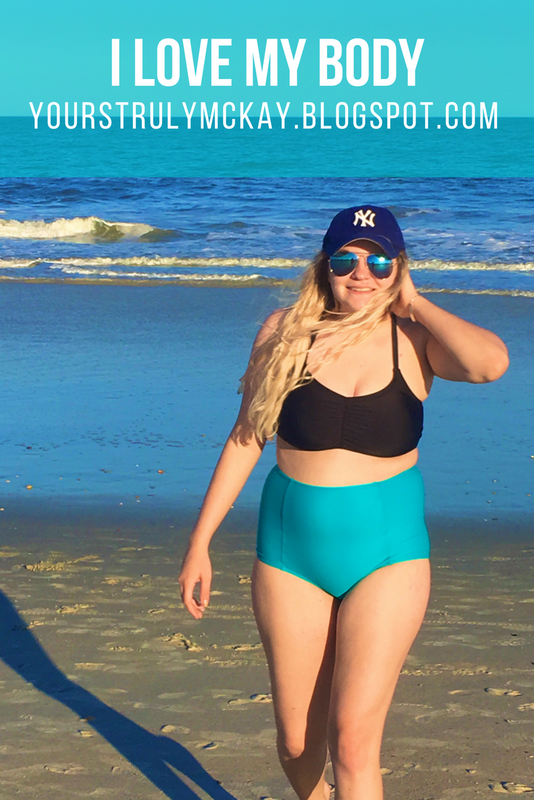 I'm not ashamed of this picture and I wasn't ashamed to go to the beach today, even though I wasn't ready for swimsuit season when I booked a flight to Florida a week ago (but let's be real, I'm never ready for swimsuit season). I'm not saying I can't improve — because I stopped running after a third of a mile at the gym with the excuse of typing this AKA I was too tired and out of shape — but I love where I'm at and am excited to grow. Hi. I know that death is uncomfortable and you never know how to treat people dealing with grief, but you can ask me about my dead sister. I can think of two very special people that have come into my life in the past six months, and both were very genuine from the beginning about their desire to learn more about my experience losing a sibling. I don't want you to dance around the topic of my family. Obviously they are a big part of my life and obviously my sister's passing has impacted me immensely. I like talking about her, honestly. Not in a "give me pity after listening to my sad tale" sorta way, but I like talking about how good of a musician she was. I like talking about her annoying laugh, her love for Star Wars and the USWNT, and how we fought over the Spice Girls movie DVD and my Dad had to break it all biblical-Solomon style. I'm not saying that everyone who has lost someone wants to be asked about it. And I'm not saying that I want to tell you all of the details, because I don't really want to relive how I found out about her death. I don't want to talk about how it felt to choose what to bury her in and designing her funeral program. I don't want to talk about the four or five nights I spent completely without sleep after her passing and how hard that was for me. And I especially don't want to talk about how annoying it was to clean her room after she died and how I'm convinced that was her last way to spite me on Earth (because it was really really annoying). But I want to talk about the happy things. I want to talk about the good memories and the regrets and how much I wish I could hug her (even though she would have absolutely hated that) and how you better never-ever take your sister for granted. Julian may have only been physically in my life for 20 years, but she will always be a part of me. She is my family and always will be. She was a friend and an enemy and a confidant and a partner-in-crime and a nuisance and a companion. 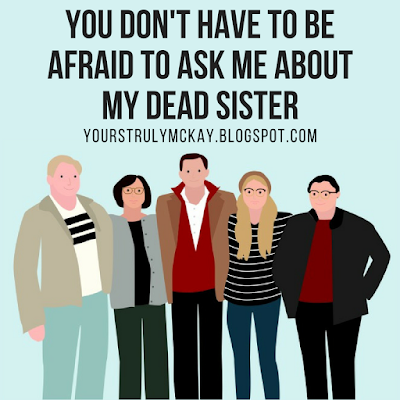 I don't want to forget anything about her, so honestly, I want you to ask me about my sister. Dating me means agreeing to be my "Instagram Husband"
I want you to play with my hair but also my hair gets too tangled to play with???? Aren't you just dying to date me now?